Valve may soon be expanding its Steam store and adding movies, TV and music to its digital offerings. The most recent beta update of the Steam client was discovered to have references to several new application-type IDs including; films, TV series, videos, plugins and music, reports IGN. The image below shows SteamDB's discovery in the Steam Beta update, you can see a before and after comparison of the same section in Steam's code. Although the content for these new app-types don't exist yet, the fact that it's been added could indicate Valve is starting to work on providing this type of content. Valve certainly looks like it is taking the first steps to turn Steam from a gaming platform into an advanced multimedia service to make it more relevant in the living room, with these new features likely to appear in future updates. 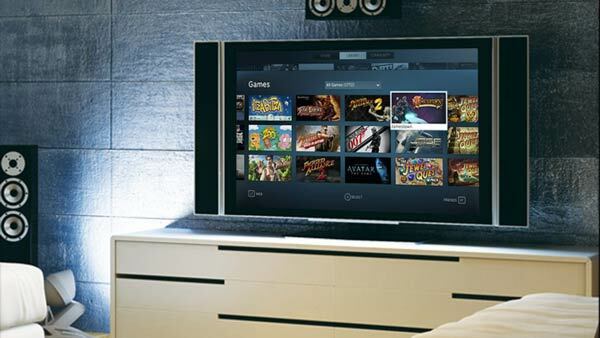 If the company does decide to expand its offerings and add Netflix-like components to future Steam boxes, SteamOS fans may well replace their current set-top boxes with a Steam Machine. Game soundtracks are already available for purchase via Steam, where songs are saved with certain games in the associated directories. Back in February, Valve launched Steam Music Beta, a feature which provides users access to their music through their SteamOS interface. However, it was thought to be a fairly limited functional addition as it only allowed users to playback music that was already stored in their local collection. If you are tired of seeing unwanted/finished games in your Steam library, you might be interested to know that Steam Beta participants are now able to hide games, with the latest update. TechnoBuffalo has put together an easy guide showing how to turn on beta access and the simple steps involved in hiding your games should you be interested. Could this possibly just be a reference to SteamOS ? as I think a lot of people who have tried it have been asking for some media playback ability. Although Valve do seem to be pushing more and more stuff onto their store, so I can believe they would sell films and music also. I'd prefer a backup/restore feature that actually worked - every time I've tried to (apps partition is now getting very tight for space) back off some old title the backup's got to 90%+ and then said that there's been some (undisclosed) error. Second on my “wish list” for Steam would be a way to have multiple library locations - e.g. a “main” and an “archive” with the ability to move games from main to archive and back again. Main Steam library is on an SSD and it's be real handy to have seldom played games migrated to a HDD-resident partition. You can have multiple library locations, which is awesome when you're running out of space! I don't know of a way to move things between different library locations though. It may be a simple as copying the game folder from one steam/steamapps/common/ to another but I haven't tried it. Regarding backup, I'm pretty sure that's just you, I just backed up gmod and it was totally fine. You can already have multiple libraries but moving between them is not a simple operation, games make entries in the registry which you could move to point elsewhere but that isn't going to be quick, maybe a few minutes worst case? Currently you can just copy the files across, delete the game in the original library then re-download and select the new library, it should find the existing files re-install. That process already takes a few minutes. I'm not sure you could automate it and leave it running in the background either since it's likely to hammer the storage devices involved, so might make your computer rather unresponsive. If you've got plenty of ram, Imdisk Ramdrive allows you to mount a ramdrive in a particular folder… ie /steam/steamapps/common/<game of choice>, and it'll run faster than an SSD and as an image file reads off mechanical drives almost as fast as SSD's, as it's a single large sequential (as long as your drive's not too fragmented) file. I run all my games this way, as I enable ntfs compression on the Ramdrive which makes the images smaller, and somehow faster as well.